There are three browser tabs continously used in my workflow: GMail, Google Calendar, and Google Play Music. I normally have many more tabs open, but these three I access periodically. As the number of open tabs increases, and I fail to cleanup, getting back to my usual three gets a little trickier. So far, I've kept each of these services open in separate windows. But that doesn't always work. Click on any link in your inbox and you're back to playing cleanup. This is where site-specific browsers (SSB) can help. 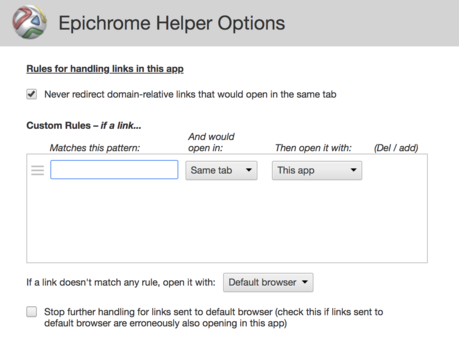 Epichrome enables you to build Chrome-based SSBs (on Mac OSX). Build an SSB for the usual suspects and easily jump to them using the app switcher. UPDATE: Enable the Chrome extension to open URLs in default browser. And choose the default browser to open URLs.